Earlier this year, federal lawmakers established the Joint Select Committee on Solvency of Multiemployer Pension Plans to address an intensifying crisis in multiemployer pensions. A primary focus of the Committee, which is co-chaired by Senators Orrin Hatch (R-UT) and Sherrod Brown (D-OH), is the projected insolvency of our national multiemployer pension insurance system operated by the federally chartered Pension Benefit Guaranty Corporation (PBGC). PBGC’s multiemployer insurance program faces a $65 billion shortfall, and insolvency by 2025, threatening the vital pension benefits of workers. Worse yet, the projected insolvency of PBGC insurance is but one symptom of systemic underfunding in multiemployer pensions themselves, which has left $638 billion in worker pension benefits—over $60,000 per worker—without financing. The committee is required to vote on recommendations by the end of November. Last week, the Mercatus Center published my study of the crisis, which lays out the causes of the shortfall and offers a suggested framework for reform. This piece summarizes the principal findings of the study. First, some background. Multiemployer plans are private-sector defined-benefit pensions sponsored jointly by a union and multiple employers. About 10 million American workers are covered by these plans, many of these workers having held jobs in construction, mining, trucking, transportation, and other service, trade and manufacturing industries. A distinguishing feature of multiemployer plans is that workers can continue to accrue benefits after they switch jobs to another employer participating in the same plan. A typical multiemployer plan is governed by a board of trustees, on which labor and management are equally represented. Employers usually contribute funding to plans at rates negotiated in collective bargaining agreements, though federal law may require additional contributions if a plan becomes underfunded. A central responsibility of the plan trustees is to establish a benefit structure that the employers’ contributions can successfully fund. Another distinguishing feature of multiemployer pensions is what happens when an employer withdraws from participation in a plan. In the single-employer pension world, such a withdrawal typically means that the plan is terminated and the PBGC assumes responsibility for paying benefits, up to limits set by law. By contrast, with multiemployer plans, what is supposed to happen is that a withdrawing sponsor makes a withdrawal payment equal to its share of the plan’s unfunded vested benefits, after which its workers’ benefits are paid by the continuing sponsors. In practice there are multiple loopholes in the withdrawal liability rules, with the result that multiemployer plans typically inherit increased unfunded liabilities whenever a sponsor withdraws. PBGC’s multiemployer pension insurance is essentially a last line of defense for worker benefits. The forward lines are provided by employers who continue to sponsor the plan after others withdraw, the idea being that this risk-pooling largely protects workers from the consequences of any single employer going under. Accordingly, PBGC’s own insurance coverage is very limited: it covers only $12,870 in benefits for a worker who has been employed for 30 years. PBGC’s financial assistance to insolvent plans takes the form of so-called “loans” which are, in effect, ongoing subsidies because such loans are almost never repaid. Gaps in statutory funding rules often allow multiemployer plan funding shortfalls to grow until a plan can no longer make benefit payments on its own, at which point PBGC enters the picture to provide support. PBGC currently faces projected claims exceeding $67 billion, as compared with a little over $2 billion in insurance program assets. If, as projected, PBGC is driven into insolvency by these claims, workers will not receive even their ostensibly insured pension benefits. Some estimates are that affected workers could lose up to 90 percent of their benefits if PBGC goes insolvent. A good first step to finding our way out of this mess is understanding how we got here. Some assume that financial market disruptions, like the bursting of the dot-com bubble in 2000 and the Great Recession of 2007-09, precipitated the pension funding problem. They didn’t, as Figure 1 makes clear. 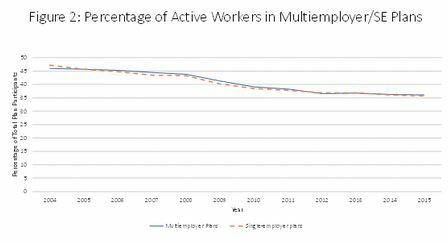 It’s true that multiemployer plans were in better shape before the stock market bubble burst in 2000, and that they took a further tumble during the 2007-09 recession. But prudent management means anticipating inevitable market declines, and in any case the market has long since recovered from those shocks. 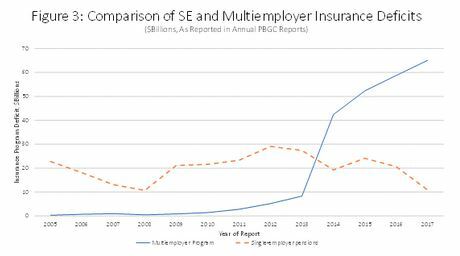 As Figure 1 shows, multiemployer plans simply started out less well funded than single-employer plans, and later failed to rebuild their funding levels during market recovery periods. 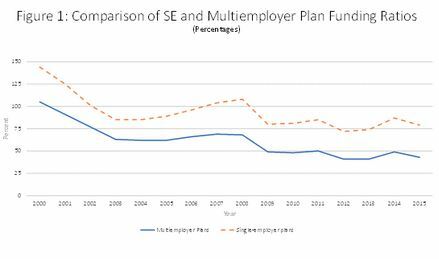 Despite the strong stock market of recent years, the share of multiemployer plans’ liabilities that are funded hasn’t exceeded 70% since 2002, and declined all the way down to 43% by 2015. It’s also often noted that multiemployer plans suffer from a declining ratio of active workers to retirees, which depresses their funding contribution base. That’s certainly true, but it doesn’t distinguish multiemployer plans from their single-employer counterparts, which face the same problem. Single-employer plans are much better funded than multiemployer plans despite their similar demographics. See Figure 2. If the aforementioned factors didn’t cause the multiemployer funding crisis, what did? The foremost causes are inaccurate valuations and lax funding rules. Unlike single-employer plans, multiemployer plans are permitted by law to value their assets at levels deviating by as much as 20 percent from current market values. But even more problematically, multiemployer plans are allowed to dramatically understate their liabilities by using inflated discount rates to translate them into present-value terms. The vast majority of multiemployer plans use discount rates of 7 percent or higher in their actuarial calculations, roughly twice the rates used to properly calculate their current liabilities. This is the biggest reason why multiemployer plans report funding percentages that are nearly 80 percent on average, when their true funded status averages less than 50 percent. Some sources tactfully say that there are diverse views on how to correctly discount pension plan liabilities. A more accurate way to put it is that there is a firm consensus among economists on how to do it, and that most plans’ actuarial practices (as well as federal funding rules) simply disregard this consensus. Multiemployer pension plans are governed by federal funding rules that are far more lax than those governing single-employer plans. Multiemployer plans are given much longer time frames to address their underfunding, and critically underfunded plans are exempted from otherwise applicable statutory penalties for inadequate contributions. Average insurance premiums paid by multiemployer plans are less than one-sixth of what they are for single-employer plans, despite an insurance program deficit nearly six times as large. Underfunded multiemployer plans are also not subject to variable rate premiums, as underfunded single-employer plans are. Finally, multiemployer plans face fewer restrictions on the growth of their benefit promises, which allows them to dig their financial holes still deeper before (and even after) landing on PBGC’s doorstep. In addition to inaccurate valuation and lax funding rules, another factor contributing to multiemployer plan underfunding is the “orphan liability” problem—i.e., the sponsors’ obligations to pay benefits to workers whose employers have left the plan. This problem is fueled by inadequate withdrawal liability assessments, meaning that it is often much less expensive for a sponsor to withdraw from a plan than to continue contributing to it. The most underfunded plans have a substantially greater share of “orphan workers” than better-funded plans, on average. The 2006 Pension Protection Act (PPA) averted a crisis in single-employer pension insurance by reforming single-employer plans’ valuation requirements and funding rules. Unfortunately, the PPA did not do the same for multiemployer plans. Multiemployer plans were instead relieved of certain funding requirements and allowed to dig their underfunding holes still deeper, with the hope that the plans might invest their way out of the problem. It didn’t work. With the crisis now metastasizing, it is essential that lawmakers avoid repeating this mistake on a still larger scale, and that they resist calls to bail out these troubled pensions with taxpayer-financed “loans” that are virtually certain to lead to larger future shortfalls. My study outlines various reform principles that should underlie any committee recommendations: accuracy in asset and liability measure­ments, safeguards against further deterioration of underfunded plans, improved incentives for plan trustees, stronger funding requirements, and premium assessments that reflect risks to the pension insurance system. Above all, lawmakers should signal that no taxpayer dollars will be used to bail out insolvent multiemployer pension plans. This is imperative for several reasons. First, it is fundamentally unfair—to taxpayers, and to other employers who have responsibly funded their pensions—if unions and corporations provide benefits to their workers without paying for them, and thereafter demand that taxpayers (most of whom are ineligible for such benefits) provide the funding. Second, bailing out any multiemployer pension plans will cause future pension funding to plunge, as other sponsors will then expect similar bailouts instead of financing their own benefit promises. Given multiemployer pensions’ more than $600 billion in underfunding, this is an unaffordable risk. The specific structures of multiemployer pension plans clinch the case against a federal bailout in a very particular way. Multiemployer pension plans are often built around an employer contribution rate negotiated between labor and management as part of a collective bargaining agreement. The plan trustees then translate those contribution rates into a benefit structure. When the trustees employ inflated liability discount rates in violation of established economics principles, this decision leads directly to inflated benefit promises to workers. It would be grossly inequitable to then transfer responsibility for paying these inflated benefit promises from the trustees who made them, to federal taxpayers. Consideration should be given to deploying PBGC resources to relieve troubled pension plans of their orphan liabilities. This would recognize the role orphan liabilities have played in worsening the pension funding crisis, as well as the role of lax withdrawal rules in fostering those unfunded liabilities. This should only be done for true orphan workers—that is, those not subsequently employed by another continuing sponsor in the plan. It should also only be done to the extent that sponsors make offsetting changes to their plans, to reduce projected claims on the PBGC net of its assumption of any orphan liabilities. This could be facilitated by partitioning troubled plans into two parts: PBGC could assume responsibility for the section encompassing true orphan liabilities, while the employer sponsors would be responsible for fully funding other workers’ benefits, under strengthened valuation and funding rules. In sum, the multiemployer pension system faces a crisis threatening millions of workers’ benefits, a crisis brought about by inaccurate valuation methods and lax funding practices. A solution to the pension problem will only last if it is built upon principles of measurement accuracy, transparency, damage control, and fairness. This means, first and foremost, requiring that employers and labor representatives only promise benefits that they are prepared to fully fund.